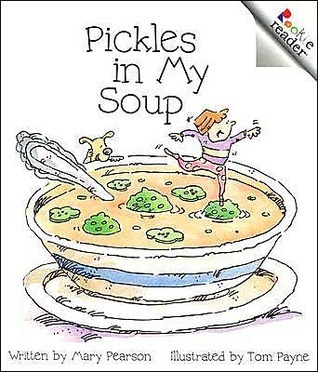 This book was disgusting. Yet amusing at the same time. some of the most off-the-wall food combinations involving pickles. Some actually made my stomach churn for real. Others were fun when I saw my younger brother say 'gross' or make a dirty face. So we got a few laughs too. Although I do not think we will be eating pickles anytime soon. I like this book because it provoke, "yeck", and a discussion of food tastes and how they change. And too much of a good thing turns to yeck. I also like the illustration where the dog is laying on the ground, waiting for drips of ice creme. It's very short story, but children can learn the words, "slice, slap, top, dip, on, in, with. They enjoy doing food game by using these words. Mary E. Pearson TomPayne - I suppose I have always been enamored with story and character. My mother tells me I could be the most annoying little kid, waking up each day as a new character. Every morning she would have to ask me "who" I was for that day, because unless properly addressed I refused to answer anyone. One time when I was about four years old, my parents were out shopping at Sears. They each thought the other had me by the hand when in fact I was exploring my own aisle (translation: I was lost!) Two salesladies found me and sat me on the counter, asking me my name so they could page my parents. I remember their consternation when I would only answer "Little Red Riding Hood." They couldn't shake my real name out of me no how, no way. I knew the value of persistence even then. My parents say they nearly fell over, when over the loud speaker they heard, "Would the parents of Little Red Riding Hood please come claim their child?" They knew exactly "who" was lost. These days I mostly wake up as myself, though I do seem to hang out with a lot of "characters" during the day.Usually when people mention their education in their bios they only mention their college degrees, but to me, it is just as important what happened way before that. Wow--second grade! I will never forget Mrs. Alsenz. Boy, could she tell a great story! She would make them up and pretty soon have a classroom of wiggly kids exuberantly telling stories right along with her. And then there was Mrs. Bonsey in fourth grade. She always praised my writing and made a shy little girl feel like she might actually excel at something. And finally in twelfth grade came Mr. Kirk, crusty on the outside with a heart of gold on the inside, who loved the English language and taught his students to do the same. (Hey, Mr. Kirk, do you see me waving at ya? )Later I went on to get a BFA from Long Beach State University in art. I worked for a time as an artist then started the most challenging job of my life--motherhood. Holy smokes, no one told me there would be no coffee breaks. But it is the most rewarding job I have ever had (watch out--I'll start dragging out the pictures) Still later, I went to San Diego State University where I received my teaching credential. I went on to teach many different grades but it was my second grade students who pushed me back into writing. During Writing Workshop I would sit with them and write, loving the process, loving the stories, and lo and behold deciding I would love to return to my first love. That's a whole lot of lovin' going on and luckily for me I was able to do just that. Not that writing is easy. I have a huge stack of rejections to prove it, but I still have enough of that Little Red Riding Hood persistence in me to keep on going.Now I write full time from my home in San Diego. My books to date are The Adoration of Jenna Fox, A Room on Lorelei Street, Scribbler of Dreams, and David v. God. More are definitely on the way.